(autoinsidernews) - Audi unveiled the roadster version of its all-new TT coupe. The new TT Roadster comes in just two versions, a base model with a 2.0L TFSI turbocharged and direct injection engine delivering 200-hp to the front wheels, or a 3.2L V6 developing 250-hp mated to quattro drive system as standard. Both models can be ordered with an S tronic dual-clutch gearbox or the standard six-speed manual shift. When equipped with the S tronic gearbox, the 2.0L version goes from 0 to 62 mph in just 6.5 seconds, and the 3.2L V6 reaches the same speed in just 5.9 seconds. Both cars top out at an electronically controlled 250km/h. 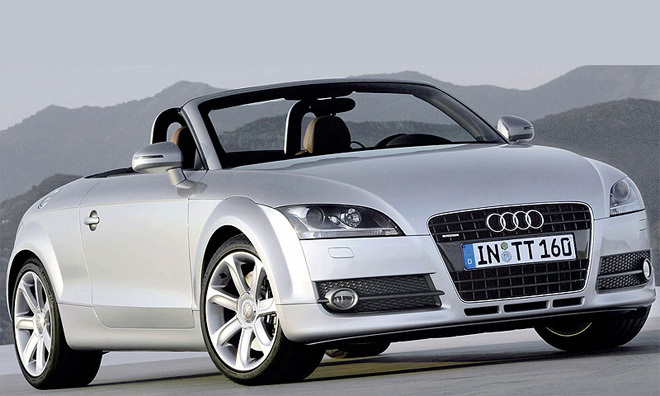 For simplicity, the Audi TT Roadster sticks with an soft-top instead of a complicated folding metal roof, reports Trend. Sales of TT Roadster will start early next year with prices similar to the outgoing model.